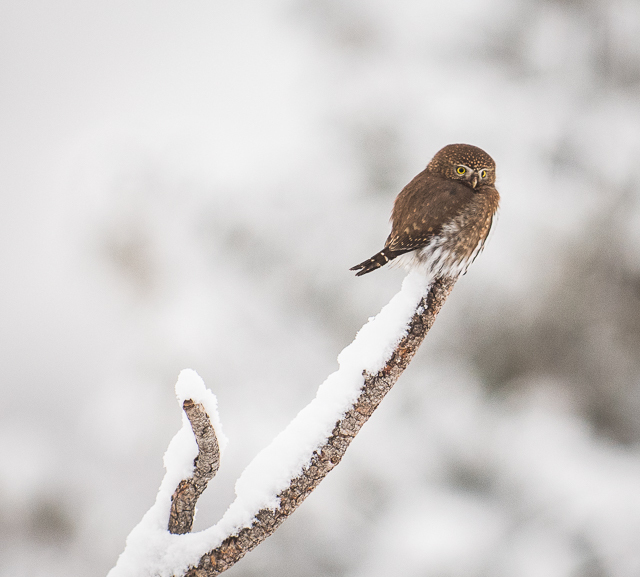 Northern Pygmy-owl strikes terror in the hearts of the finches. 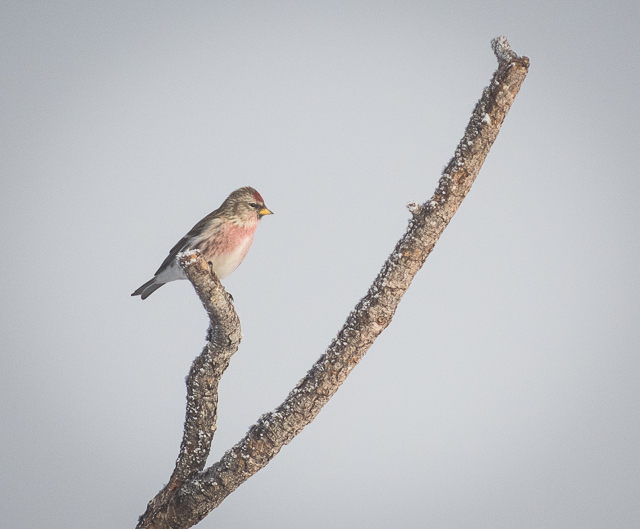 Common Redpoll. It is in the same family as American Goldfinches and Pine Siskins. This is an irruptive species, showing up in big flocks some winters and other years they stay farther north if the food is plentiful. This year I have been seeing a flock of 100 or more some mornings. Honestly, I have no idea where the time goes. I finally just let go of November images. November was mostly warmish and very wet. And December has been cold and dry. Seems like every other day we get an inch or two of fluffy powder snow that can be swept rather than shoveled from the porch. Quite different from the heavy wet snow that fell last year early in the winter. I have gotten used to the cold and if the temperature gets up to freezing, it seems warm, almost balmy! Skate and classic skiing has been excellent on the Methow Trails! Morning walks have been beautifully illuminated with wondrous light. November is not really a great month for birding but I did manage to see a few interesting birds and get some photos of them. Most of these were taken from our dining room looking out at our feeder snags. Yesterday I noticed some Mourning Dove feathers on the ground. It was probably nabbed by the Sharp-shinned Hawk. She’s been a regular visitor for several weeks but this is the first evidence I’ve found indicating she is successfully hunting here. Mostly she cranes her neck and watches for some small unsuspecting bird to return to the feeder. I think she’s a female because she is rather large for a sharpie. The males are smaller. The Northern Pygmy Owl was here before the snow fell. I saw it catch a vole and I wonder where it is hunting now. Voles are hard to find with the thick snow cover. The female Northern Harrier was seen on a walk at Big Valley. She was on the ground unnoticed by us and lifted into the air when the dogs got too close. We called them back and she returned to the same spot. I imagine she had a meal – maybe a vole or mouse. We walked on and left her alone. A male Northern Harrier would have been silvery gray. Northern Shrikes are winter birds here. They nest farther north, in Canada. They also eat small birds, reptiles and mammals in addition to insects. 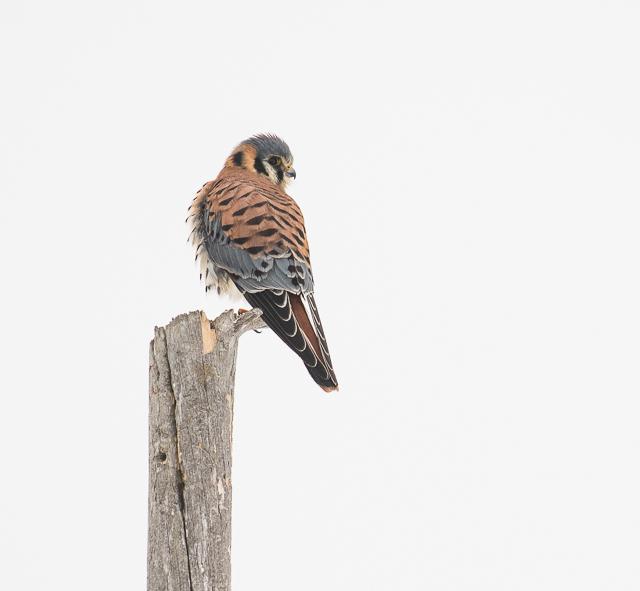 This one made a lunge at a dove, a much larger bird, with no luck when I saw it. There have been lots of Northern Flickers around recently. They particularly like the suet feeders. They share them with Hairy and Downy Woodpeckers and also Black-billed Magpies. The Pileated Woodpeckers have had a heyday with our burned trees. Insects invaded the trees almost immediately after the fire and then the Pileated’s began to break off great chunks of blackened bark in search of the larvae. They continue to return day after day so they must be successful. The little woodpeckers are also hard at those dead trees. The pair of Bald Eagles were on a well-used snag above Big Twin Lake. In the summer I often see an Osprey there. Pileated Woodpecker. On the bottom left you can see a chunk of bark just chipped off.